No-Compromise Electrical and Mechanical Technology. Maximum possible gain at high bandwidth and good side lobe attenuation as well as good f/b ratio. These antennas offer the ultimate performance for the serious V/UHF ham operator for DX and all transmission modes. The basis for the antennas has been designed with the xxNEC computer simulation programs and have been verified by many real-life trials + tests. The inner electrical signature of the perfect yagi asks for homogenous current distribution from the active element to the tip of the antenna. Our yagis were optimized for an ideal current distribution profile. "Older" concepts display sudden current "jumps" between antenna elements which leads to reduced gain and bad side lobe attenuation and low f/b ratio. Other comparable types of yagis require 2-3 elements more and consequently introduce more losses. Keep in mind: Antenna gain mainly depends on the boom length of the antenna and not so much on the number of antenna elements! The elements used consist of high conductive aluminum material with a diameter of 8 mm. This represents the best compromise of minimizing losses on one hand and resulting wind loads on the other hand. When using thin antenna elements additional losses are being introduced as well as the significant effect of the skin effect in V/UHF frequency range. Yagi designs of such specifications fall short of 0.5 dB in gain mainly caused by bad conductivity! The element mounting displays long-term stability and durability by the use of ultraviolet-resistant Polyamid clamps. The electrical specifications do not alter nor change within many years of use. Would the mechanical construction introduce a direct fix of the antenna elements onto the boom by means of clamps it is very likely that corrosion alters the effective element dimensions (electrically) and consequently a slow process of antenna performance degradation would take place! Yagis use N-jacks (female), the balun is protected in the connector box! The dipoles are true folded dipoles with a Teflon balun mounted in the center feed. This is a non-compromise solution avoiding the known problem of RF travelling along the outer surface of the coax's shield. Similar to the 2-m antennas the connector is an N-type. The center feed box is absolutely weather proof, sealed and additionally filled with Styrofoam. The Teflon balun is embedded into the center feed box. As seen with other antennas there are no balun slopes hanging out of the connection box and no need to affix the slope somehow to the antenna. Consequently, this design has no problems whatsoever with humidity leakages. Yagis use 8mm diameter on elements (below)! We utilize elements with a diameter of 8mm. This results in an extended bandwidth but same gain compared to thinner elements! The windload increases just a little bit which plays absolutely no role when using today's modern antenna rotors. Material of the elements: A highly conductive aluminum alloy we use to minimize the skin effect; DK7ZB has calculated (based on technical material from K6STI) that the losses due to the skin effect can add up to 0.8 dB for antenna elements made of stainless steel. Of course, the losses are even worse in the 70 cm band. Fixed is fixed - we are not in favor of clamp-on connectors. The WIMO-Yagis feature elements which are fixed to the boom by means of stainless steel bolts and nuts. This guarantees low-resistance and un-hampered functionality for years to come. Each element is fixed to the boom by means of a 3 mm stainless steel bolt. We assure you we never "lost a boom" because of the additional screw holes in the boom! Yagis use stainless steel screws! All nuts, bolts and washers are made of stainless steel with the exception of the mast clamp itself. This guarantees a long antenna life time. The antenna element mounts are made of Polyamide material which is highly resistant to the destructive effects of ultraviolet light. In case of the cross yagis the elements are fixed to the circular boom made of aluminum. Crossed yagis can be mounted diagonalyy or horizontally/vertically! Yagis allow balanced mounting of the antenna! All long yagis with twin boom (except WY-214) have a separate boom-connector for installation; such the mast clamp may be mounted independent from the boom-connection at the center of gravity (not on WY-214). Yagis have an excellent manual and description! Extra charge: High-Power-Dipole with max. power load 1200 Watt PEP on 2m, 800 Watt PEP on 70cm. This extra charge has to be ordered per dipole, i.e. two times with the crossed yagis! The permanent quest for the last 1/10th of a dB, however with linear polarisation... cross yagis are BETTER! Design according to DK7ZB: optimized current distribution over the antenna system, consequently low real losses. 2x14 elements, boom length 10.2 m, gain 15 dBD. The antenna has a circular boom without additional support strut, so there the pattern is not affected. The antenna has a 'guy tower' made out of rugged fibre glass tubes; the antenna is guyed both vertical and horizontal using UV-proof guy wires. High bandwidth is acheived using 'thick' elements with 8mm diameter. As all our WiMo Yagis this one is delivered with sealed folded dipoles with teflon balun and N-jack as well. 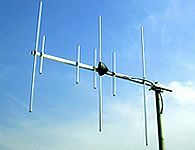 No-compromise yagi for 2m and 70cm, consisting of a 3-element yagi for 2m range and a 6-element yagi for 70cm. 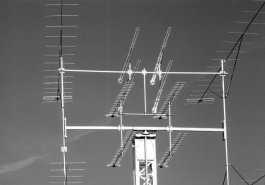 Separate systems with nearly zero interaction between the two antennas. With separate coax feedlines both bands are useable at the same time! Fore-mast design, but the mast clamp can be installed in the center of gravity as well. Compact and lightweight dualband yagi antenna for 2m and 70cm, with one common connector. Requires only one cable down to the radio, ideal for dualband radios with integrated diplexer. Consists of a 3-element yagi for 2m and a 5-element yagi for 70cm. With it's little weight the antenna is perfectly well suited for portable operations or a vacation. The antenna is installed in front of the mast, the supplied mast clamp allows horizontal or vertical mounting.